produced software templates and remote access that allow updating and troubleshooting. Perfect Prototype met the schedule and budget – and our high standards of quality. 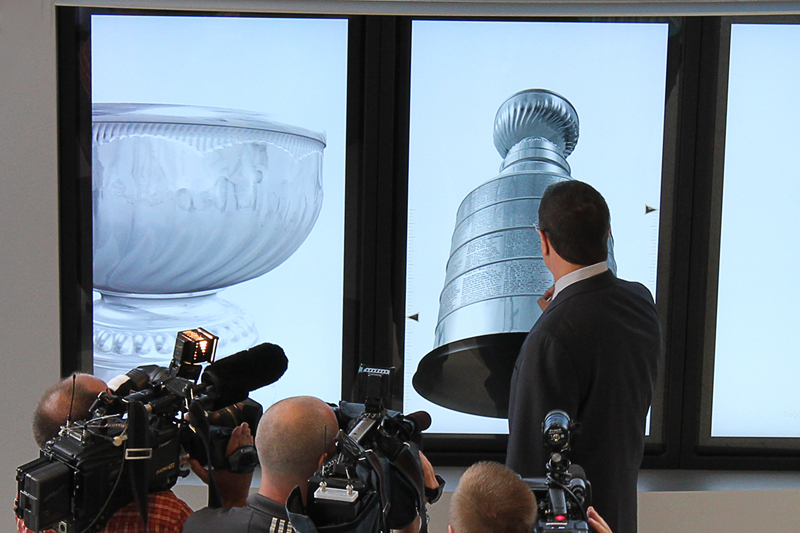 Perfect Prototype developed an intuitive way to preserve the excitement of viewing hockey’s Stanley Cup whenever and forever. Fans use an iPhone-like interface to rotate and zoom the Cup, and read inscribed names from past winners. Of course, all three of the Pittsburgh Penguins winning years are highlighted, and selecting them shows a video highlight reel of the greatest moments from their championship series. a unit dedicated to displaying the greatest fans, streamed from the sponsor’s website. The attention-grabbing kiosk combines advanced augmented reality technology, Web-connected touch-screens, and fun. Face-recognition and HD cameras running at 1920×1080 resolution capture the fan on screen and trigger the AR engine to superimpose one of eight 3D “game faces” selected by the user. Fans can enter their email addresses to have their images instantly emailed to them. A 3D display showcases over 100 jerseys and links to Pittsburgh-area high school and club teams. Live news and statistics from all the local teams can be accessed through the three kiosks. A showcase of videos and photos highlights the Penguins’ history. Fans can have their picture taken in the lobby, which is composited into a printable souvenir, emailed to them, and entered into the sponsor’s “Fan of the Week” contest. Once uploaded to the sponsor’s contest, photos go into rotation on a monitor in the “All Time Team” exhibit. The Kids Zone includes two different interactive games. The face-off interactive tests quickness with a real hockey stick in hitting a virtual puck when dropped. Can you beat Mario Lemieux? The “Match and Learn” section consists of a single monitor that lets fans play a Wii interactive, match players to childhood photos, and learn, for example, how pucks are made.